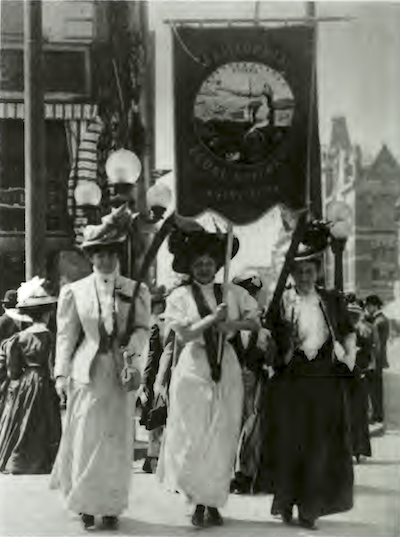 California Genealogical Society and Library blog: Do You Descend from a California Suffragette? Do You Descend from a California Suffragette? 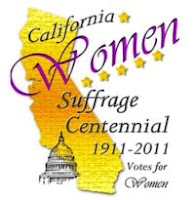 October 10, 2011 is the 100th anniversary of California women's right to vote and women all over the state are planning parades and other events to commemorate the centennial. October 10, 1911 was election day when the men of California voted to allow what only five other states had done. Wyoming, Colorado, Utah, Idaho and Washington were the first five states to grand suffrage. By 1914, seven more states followed and a national campaign towards a federal suffrage amendment began in earnest. By the time of the 1916 presidential election the party platforms of both Democrats and Republicans had endorsed suffrage reform. Congress passed the Nineteenth Amendment in 1919. It was ratified by three-fourths of the states the following year and became law. One of the iconic images of the California campaign was taken on August 27, 1908 in Oakland. Three women – Lillian Harris Coffin, Mrs. Theodore Pinther, Jr. and Mrs. Theodore Pinther, Sr. – led a parade of 300 suffragists to the Republican state convention. Lillian Harris Coffin, Mrs. Theodore Pinther, Jr. and Mrs. Theodore Pinther, Sr.
CGS member Carol Norberg brought the photograph to my attention. Carol is helping to plan a Centennial parade and she thinks it would be wonderful to find descendents of the Oakland marchers to take part in the celebration. She would like to honor the early California suffragists by reaching out to their descendants, including those who may not even know what their ancestors did. In her research in Oakland newspapers, Carol has secured the names of thirty women who were mentioned there, but being new to genealogy, she has not been able to make much progress. She would especially like to locate descendants of Lillian Harris Coffin and the Mrs. Theodore Pinthers. I had time to do just a little sleuthing and was able to find records for the Pinthers in San Francisco. While there was more than one Lillian Cofflin living in the Bay Area, records for a Lillian Harris Coffin point to her being the wife of Horace Coffin of Marin County. If you descend from a California suffragette, have time to do some research or have other information to share, please email Carol Norberg. 1. Silver, Mae and Cazaly, Sue, The Sixth Star: Images and Memorabilia of California Women's Political History 1868-1915, Ord Street Press, San Francisco, 2000, http://lwvc.files.wordpress.com/2010/12/sixthstar00silv.pdf : accessed 17 July 2011. 2. Rodes, Donald Waller, "The California Woman Suffrage Campaign of 1911: A Thesis Presented to the Graduate Faculty of California State University, Hayward, In Partial Fulfillment of the Requirements for the Degree Master of Arts in History," 1974, http://lwvc.files.wordpress.com/2010/12/casuffrage.pdf : accessed 17 July 2011.